Remove salmon from refrigerator 45 minutes before serving, pat dry, and season with salt on both sides and on edges. Heat a gas grill to medium (350° to 400°), with one burner turned off to create an indirect-heat area. Drizzle salmon all over with olive oil and rub in gently. Oil cooking grate, using tongs and a wad of paper towels drizzled with vegetable oil. Lay salmon on grill, skin side up and with thinner tail section over indirect-heat area. Set lemons over direct heat. Cover grill. Cook lemons until juicy and partly charred, 6 minutes; transfer to a bowl. Cook salmon until edges begin to curl, 8 to 10 minutes. 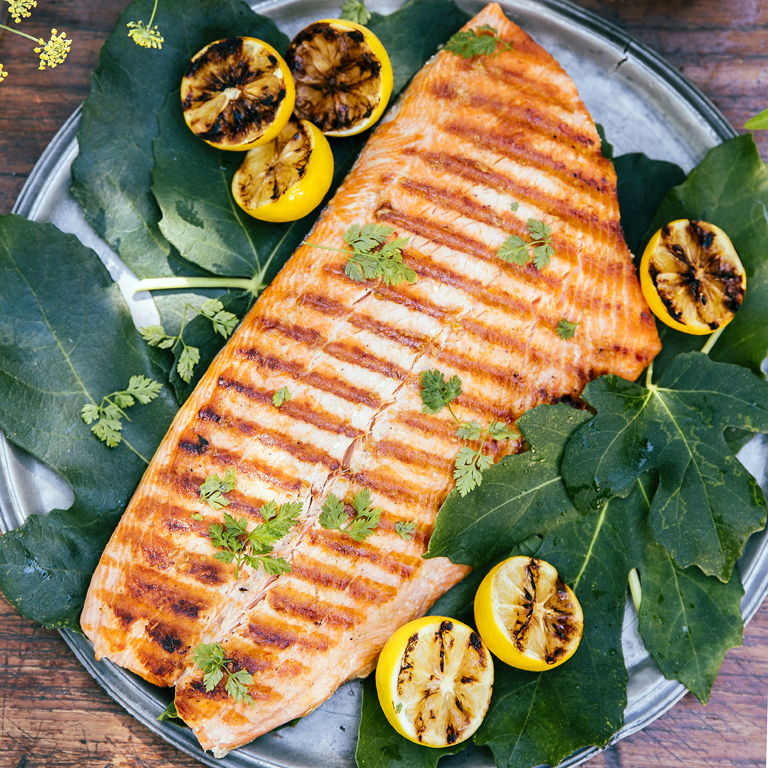 Carefully loosen salmon from grill with an offset cake spatula or wide metal spatula, sliding it all the way beneath fish. Using spatula to lift salmon, slide a rimless baking sheet underneath. Set another rimless baking sheet on top of salmon to sandwich it, then flip the sandwich over. Lift off top sheet, angle bottom sheet with salmon against cooking grate, and carefully pull sheet away from salmon, easing it onto the grate skin side down. Close lid and grill salmon until just firm to the touch, 3 to 5 minutes more. Slide spatula between fish and skin, then ease a rimless baking sheet under fish and lift off, leaving skin on grill. Line a platter with fig leaves, if using. Angle baking sheet against platter and slide salmon onto it. Sprinkle salmon with chervil leaves and set caramelized lemon halves around it.